Joseph Vella, L-Oniċe taż-Żebbuġ, BCD Printing – Gozo, 2013. 44 pp. L-Oniċe taż-Żebbuġ is the name of a new publication from Gozo which features the history of the famous find of onyx in a field in the northernmost Gozitan village of Żebbuġ. This find was to lead to the covering of the entire interior of the village’s parish church with the same onyx. Whoever visits the matrice parish church of Żebbuġ in Gozo will be instantly struck by the inner beauty of the sanctuary church, dedicated to the Assumption of the Blessed Virgin Mary. Sitting on the central part of the plateau, known among the locals as Ix-xagħra l-kbira, the parish church is the hub of the village. The field in which the onyx was found a few years before the death of the first parish priest, Dun Franġisk Vella, in 1743, was in the area known as Taċ-Ċaqra or Is-Sagħtrija. Fr Joseph Vella, a retired priest from Żebbuġ who spent a lifetime of service in the American Navy, traces the history of this renowned find from its roots to the present day. 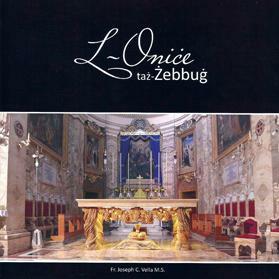 Back in 1988, when Fr Vella had already fallen in love with the history of his own native Żebbuġ, he published Iż-Żebbuġ, Il-Parroċċa ta’ Santa Marija. The publication gave a detailed account of the history of the parish. The latter was erected an independent parish in 1688 by decree of then bishop of Malta and Gozo Davide Cocco Palmieri. In his latest publication L-Oniċe taż-Żebbuġ, Vella includes first-hand information about the family of Salvu Cefai, the owner of the fields in the northernmost part of the village. Together with his wife and family, Salvu decided to donate a large part of the onyx found on his property to the parish church of his home village. Fr Joseph Vella’s publication is a mini coffee-table book full of sumptuous photographs taken by local photographer John Cordina. In its first pages it also features the decorative logo of the parish, designed by parish priest Fr Reuben Micallef, for last month’s festive celebrations commemorating the 325th anniversary of the Żebbuġ parish. Vella’s book is definitely a publication to be cherished by all those who want to know more about Gozo’s churches, known worldwide for their beauty and splendour.